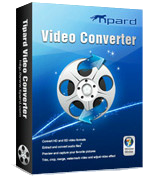 Tipard Video Converter is a professional video converting piece of software which can help you convert video to any 4K UHD/HD/SD format with high quality and speed. It supports all frequently-used video/audio formats like MP4, AVI, FLV, MOV, MKV, VOB, WMV, MTV, 3GP, MTS, M2TS, MPG, MP3, AAC, AIFF, FLAC, WAV, etc. With this powerful video converter, you can easily get your video/audio in the desired format within just a few clicks. Moreover, it is equipped with multiple functions for you to edit video and adjust output effects. You can use it to convert a common 2D video to a fantastic 3D movie, crop/clip/merge/rotate video, enhance video quality, adjust video effect like brightness/contrast/saturation/hue and more. Users can get all Tipard software in half-price by using this coupon code.